EDINBURG — Hidalgo County Commissioners suspended Tuesday the supplemental salary given to District Judge Rodolfo “Rudy” Delgado, a decision that comes on the heels of Delgado’s March 1 temporary suspension without pay by the State Commission on Judicial Conduct. Hidalgo County pays its district court judges an annual supplement of $18,000, according to Julia Sullivan, the county’s public affairs director. The stipend is on top of the annual $140,000 salary district judges are paid statewide. Delgado was indicted on federal bribery charges and violating the federal Travel Act for using a phone to broker the alleged bribes with a local attorney. He pleaded not guilty to the charges last week. His suspension by the state commission on judicial conduct will remain in effect while his case plays out in federal court. If acquitted of the charges, the suspension will be lifted. If found guilty, Delgado would be automatically disqualified from serving on the bench. The Fifth Administrative Judicial Region continues to appoint a visiting judge to hear cases in Delgado’s 93rd state District Court. 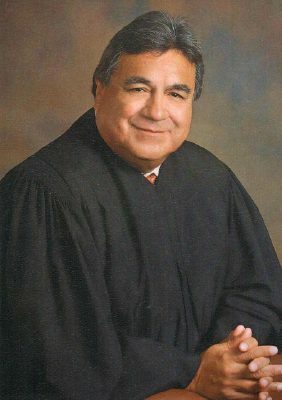 Robert Garza, a retired Cameron County district judge, has been appointed on a biweekly basis since Feb. 5. The fifth region could not be reached for comment as to whether Garza will be appointed indefinitely while Delgado remains suspended from the bench.